Magic Bullet 4: Wouldn’t it be cool if all our relationships were healthy? Sleek. Shiny. Silver. And totally ineffective. I used to think this was a do-able accomplishment – great, healthy relationships all ’round. I reasoned if I just played nice, everyone else would, too. I know, I know: trés naïve. But admit it: wouldn’t you like your relationships – all of them – to be comfy and comforting? But you know that isn’t how life works. Our relationships – within families, among friends, with “romantic others,” with coworkers, with neighbors – can look alarmingly like The Soaps. What to do? For starters, don’t even think about reaching for a magic bullet to fire off at your broken or almost-broken relationships. Do think about reaching for plain ole ordinary bullets which can help you slog through the fixing-up of broken relationships. Bullet number one: books. Entire sections of bookstores and libraries are devoted to this one topic of making relationships work. Ninety-nine percent are written by qualified people. Well, maybe more like 85 percent; exercise caution. Regardless, check them out. Ask friends for their opinions on these kinds of books. Bullet number two: other people’s relationship experience. While books help, other people’s real-life experiences are just as helpful. Chat up older people with healthy, long-term relationships. Even people your own age, who seem to have a large number of healthy relationships, can help. Get counseling from a judiciously vetted counselor who shares your world view. By using all of these bullets, I’m gradually doing better at learning how to keep and nurture the relationships I should and how to let go of the relationships that are unproductive and, in some cases, pure poison. It is a process, though. About the time I think I’ve mastered the letting-go of poisonous relationships and the keeping of healthy relationships, I goof up again. Here’s a little aside: if you like cleaning in general, you may find you quite enjoy the therapeutic effects of tidying up the relational messes of your life. If you don’t like cleaning, do you like successful living? Thought so. Relationship conflicts, as you well know, are caused by a myriad of reasons. That said, my personal experience tells me that more often than any of us would like to admit, they’re caused by someone who has chosen a behavior or lifestyle that’s several degrees – maybe as much as 180 degrees – from how the other party lives and what they believe. One or both of them are simply too uncomfortable to keep up the relationship. Somebody has to go. But few of us enjoy hacking people out of our lives. So we make wimpy efforts, using kindergarten, blunt-nosed scissors in our clumsy and feeble attempts to cut out people who really shouldn’t be part of our lives. Seldom have I seen this work, as wimpishness almost always begets more wimpishness. On and on the sick relationship goes, with neither party happy. At this point, I’ve found I have to ask for divine help. It’s time to ask God to help me cut out a relationship that’s abusive or dragging me down emotionally, morally, or physically. Sometimes it’s a relationship that has become a caustic eating away at all that I believe and am. It has to go, but I seem incapable of making it go away. The good news? When we invite God into the equation, he usually uses a no-nonsense, whopping pair of tin snips. When He pulls out those puppies, He cuts us free – as in FREE. Does someone in your life persist in behaving in a way that you cannot condone or makes you disturbingly uncomfortable? Do they refuse to change their behavior? Do they keep holding out the promise that they’ll do better, and then don’t? Then they don’t want a healthy relationship with you, and your relationship with them is doomed, for now. Should you snip that relationship from your databank of relationships? Yes, you should. Should you forgive them, even though they show no remorse and obviously don’t want a healthy relationship? Of course! Forgiving is necessary for our well-being. “But it’s so hard.” Yes, it is. Here’s a tip to make it easier to forgive in those sticky relationships: forgiveness and reconciliation are not synonymous. 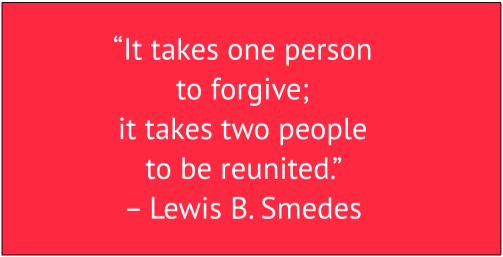 While reconciliation cannot occur without forgiveness, forgiveness can occur without reconciliation. Translation: reconciliation takes two, always.